This weekend I've been at university with Mina. It's always lovely to meet up with my friends and fellow students - particularly when we have our dogs with us - and to have a whole weekend of learning and talking 'dog'. This weekend was no exception to the rule. Saturday was filled with a number of practical lectures, two 'train a new behaviour' practical sessions plus a lecture from the head of the South Yorkshire Police victim support dog unit. All in all, it was a jam-packed day, which was rounded off by a lovely beach walk with some of my friends and their dogs. Both Mina and I came away pretty pooped but looking forward to today, when we would be able to have some 1-2-1 time with the lecturers and time to practise our chosen discipline of agility. I'd pretty much decided that for the agility session I wanted to focus on getting Mina's contacts right. I wasn't planning on introducing her to the contact equipment fully and had set my training criteria quite carefully. I planned to slowly introduce Mina to the contacts on the A Frame and get her comfortable with just being on the contact part (using lots of positive reinforcement and homemade liver cake) and then to ensure she would wait and target my hand (eventually working up to just a nose/head dip) before being released. Due to Mina's size, age and conformation I decided that a nose target to the ground wasn't appropriate. As it turned out, Mina had different ideas to those that I'd carefully planned! Whilst I was sorting myself out with treats and our lecturer, Lynda, was holding Mina's lead, Mina had different ideas. Before we knew it, she'd walked on to the contact area and calmly started walking up the A Frame (with Lynda holding the lead) and, just as calmly, walked down the other side and waited on the contacts. I was dumbfounded and overjoyed, all in one go. Mina always used to have 'mountain goat' like tendencies when she was younger and used to love scaling the embankments in one of the parks in Northumberland, when we lived in the NE. However, at her current age, I didn't think she'd take to scaling the sides of the A Frame quite how she did. Now, normally, I wouldn't encourage anyone's dog to scale the A Frame (or any agility equipment) without doing the foundation work. The chances of it going wrong and the dog developing a fear of the equipment can be too great. So, as Mina had taken matters into her own paws, I worked with her. We did several repetitions of the A Frame, all with me holding her collar whilst she walked over (it is more stable holding her collar than lead, but as she'd started scaling it whilst wearing her lead, we didn't take it off the first time) and lots of liver cake at the other end. ...the tunnel isn't really an ideal size for greyhounds but the lure of the venison liver was strong and Mina calmly made her way through the tunnel for it and we practised this several times. I am so proud of Mina. She constantly amazes me with her capacity to learn and to disprove the many myths that surround older dogs and greyhounds. Mina is the proof that you can teach an old dog and greyhounds new tricks. But, enough of my pride; what lessons did Mina teach me? Firstly, she taught me role reversal - sometimes our dogs become the teacher. Despite me having set the criteria of gradually introducing Mina to the contacts of the A Frame, she took matters into her own paws (so to speak)! I think sometimes, when we're training our dogs we can forget to look at what our dogs are really telling us and we can fail to adapt our training around them. Secondly, Mina showed me again how important it is for us to really know our dogs - especially when they've reached their training limit. I was having tons of fun - after all, Mina was proving to be a super star - and I wanted to continue but the signals from Mina was that she was well and truly pooped. She would have continued because I wanted her to but she wouldn't have enjoyed it and, knowing our luck, would have injured herself. I think it's a human tendency when our dogs are doing well to have the "just one more go," "just one more repetition before we finish" mentality. I've heard so many stories how the 'just one more go' has pushed dogs to their limits and has meant a lengthy recovery and rehabilitation process to get them back to their former selves. I never want to do this to Mina or any of my dogs. So, we finished on a high and both had a cooling drink before setting off home. Luckily for Mina she could snooze in the back of the car and dream of being a mountain goat for the day! Back at the end of January I wrote a post about Mina's first agility 1-2-1 (Jumping at the Chance: Greyhound Agility). Since then we've had two more 1-2-1s and I've invested in some agility jumps and a set weaves to practise with at home. Now, here comes the tricky bit... by February 2013 both Mina and I need to be able to complete (note: I say 'complete' not 'compete') a grade 3 agility course - yikes! It's all down to the Advanced Dog Training module of my university degree. I did have the choice of other doggy disciplines such as gundog, obedience, scent work, working trials and flyball - along with the college tests (which are a mish mash of everything), however none of them really appealed to me as much as agility. So agility it is for both Mina and I. We both have so much to learn and I have a rather hefty training plan and schedule to produce to illustrate how we're going to get from complete novice to completion of a grade 3 course (double yikes)! Before Crufts I had been looking at agility equipment on Ebay and 'watching' several items - deliberating whether to spend my birthday money on them (or not). When I arrived at Crufts I was pleased to see that one of the Ebay suppliers I'd been watching - Jesse Jump Agility - was there. So, I took the plunge and bought three 'deluxe' jumps and a set of 6 'deluxe' weaves. I tried out the jumps - which are three quarter width - with Mina and she loved them, as the video shows. Since buying the home agility equipment, I've attended an Agility Training the Trainer Course. I plan to incorporate elements of agility into my dog training classes and really wanted to learn how to do it properly. The course was run by Kim Hunt who runs Derbyshire Agility Centre. Kim is a qualified animal behaviourist and has over 20 years' experience as an agility judge and competitor. The course was jam-packed with information, practical demonstrations and the chance for us to undertake short training sessions with volunteers. The focus was on pre-agility work and introducing dogs and handlers to the equipment safely. I've come away with some great ideas of how I can help Mina prepare for each piece of equipment and more importantly, how I can incorporate this into my training plan. Also, as an added bonus, the exercises are easy to incorporate into my training classes and 1-2-1s and will help owners and their dogs with focus and bonding. So, what's next? Well, we've a long list and to get to the stage of completing a grade 3 course feels like a mountain climb. I'm going to be putting the work in on the basics like targeting, establishing a solid wait and working on forward focus (amongst other things) and working on my coordination! I'll share details of our progress along the way and if you've any agility tips to share, please don't be shy - I need all the help I can get! Crufts is over for another year and away from the dramas of the show ring (and this year there was plenty of drama with a number of high profile breeds failing the newly introduced independent vet checks), there is much more to discover about dogs than whether they conform to the Best of Breed, Best in Group or Best in Show. If you've visited my blog before you'll know that I'm a greyhound fanatic. If this is your first visit, first of all - hello - and secondly be prepared for lots of posts about greyhounds! This post is no exception to the rule and the subject of this post is a truly remarkable hound who is making a difference to children in schools across the country. So, who is this greyt hound you may ask? Well, his name is Danny - a beautiful, blue and white greyhound who was found wandering the streets of Cork and was rescued by Tony Nevett. In my opinion, all greyhounds are special, but what makes Danny even more special is that he is a listening dog and helps children improve their reading skills. He's also one of the first Bark & Read Foundation dogs, which is an initiative supported by the Kennel Club. Danny's next adventure is a trip stateside to Iowa. In August this year, Danny and Tony are off to work with Corridor Therapy Dogs - a dog therapy organisation that works with local libraries and authors. 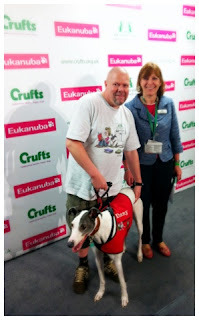 They will help show the 'greyt' help that dogs can be helping people learn to and enjoy reading. If you'd like to find out more about Danny's trip and how you can support his American adventure, you can visit Danny's facebook page - Danny on Tour. One of the 'greyt' things about Crufts is the chance you have to meet up with fellow dog lovers and find out more about them and their passions. One such person is Peter Laurie, the new Chief Executive of the Retired Greyhound Trust (RGT). Peter is a greyhound lover through and through and became CEO of the RGT on 4 July 2011. 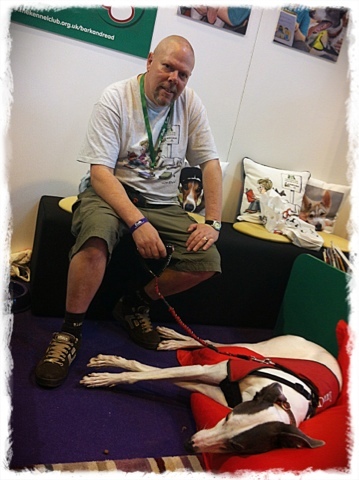 He took some time out of his busy diary to chat to me about why greyhounds make such good pets and what the charity's plans are for the coming year. The RGT is a national charity which, as its name suggests, helps rehome retired racing greyhounds once their racing days are over. The RGT rehomes hounds through its network of around 70 branches, all of which are staffed by volunteers. The cost of rehoming hounds doesn't come cheap and although the racing industry makes a contribution to the RGT, the charity still needs to supplement this to help rehome all the dogs in its care. Some of the ways the charity does this are through events such as the Great Greyhound Gathering (you can read my blog post about last year's Gathering here) or the Greyhound Extravaganza. 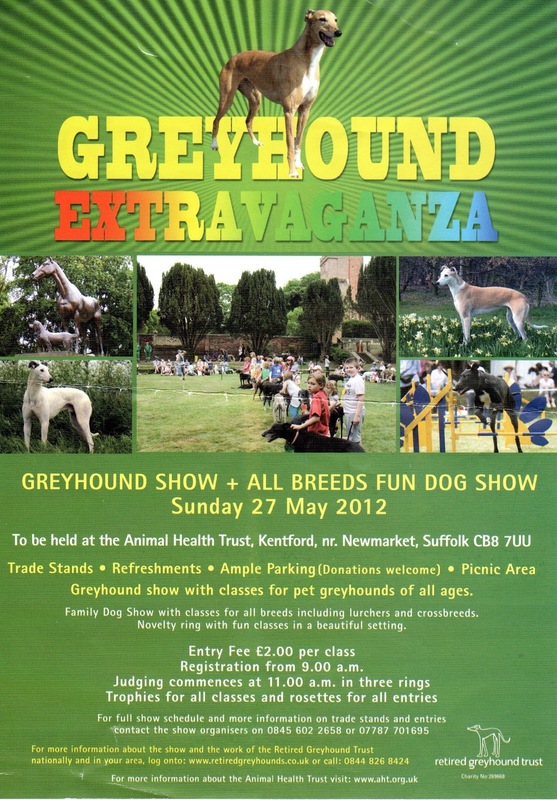 This year, the Greyhound Extravaganza is taking place on Sunday 27 May at the Animal Health Trust, nr Newmarket. 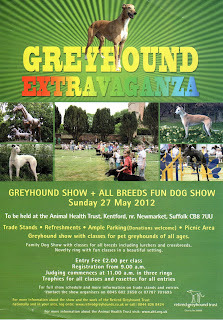 It promises to be a 'greyt' day out for humans and hounds alike. Unfortunately, it's a tad too far for me, Mina, Stevie and Jasper however, all is not lost as we have the Great Greyhound Gathering in September to look forward to. 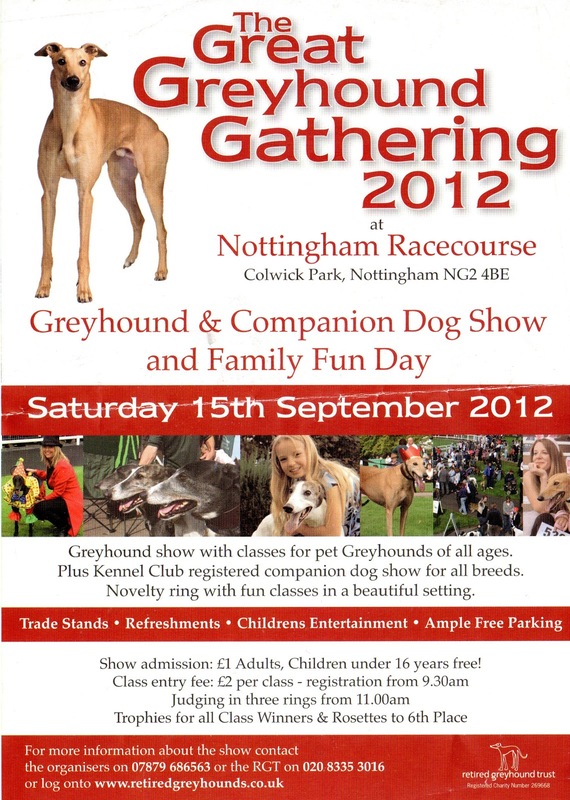 The Great Greyhound Gathering is happening on Saturday 15 September at Nottingham Racecourse. This is a little nearer for us, so is an event we'll definitely be attending. 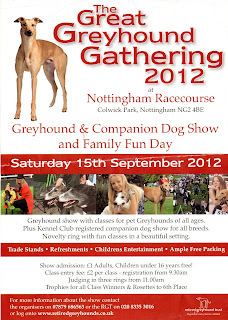 The Great Greyhound Gathering, or GGG as its known, is a fabulous day for greyhound fans and is not to be missed.